The Ranmin Bellair Bungalow affords such a luxurious and relaxing environment; so much so, leaving the premises could be a daunting task. But for those who like to venture beyond the boundaries of the Bungalow grounds, there are a number of adventures waiting to unfold. 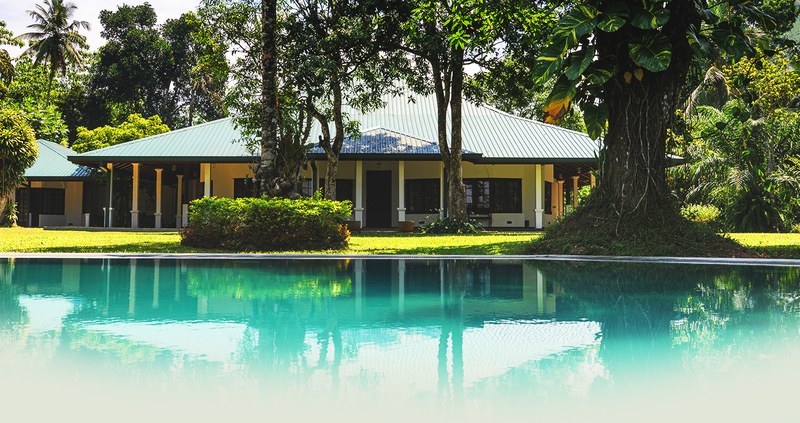 Besides the breathtaking views of the surrounding rubber estate kissed by an ever azure sky, the area is also speckled with bathing spots along the way leading to the Bungalow. Little hidden rock pools can be found just 2km -3km away from the Bungalow. A trek through the shrubs could end in a refreshing dip in one of the many natural pools of the area. Situated on the Puwakpitiya Road, and just about 1.5km away from the Bungalow is the Kumari Ella Waterfall, named after King Sitawake Rajasinghe’s daughter. It is rumoured that the Fall hides a secret tunnel belonging to the King’s reign. Though just 4km in height, the Fall is a refreshing sight for sore eyes. The water from here eventually flows into the Kelani River. The natural pool beneath the waterfall named ‘Kumari Wala’ is another popular bathing spot among villagers and travelers. The other Waterfall found in the vicinity is the Thummodera Ranmudu Falls. 15m in height, it stands in a scenic location in the midst of a flourishing mountainous forest area. The Waterfall has its own ecosphere and is just about 5km away from the Bungalow. The Thummodera iron bridge in the ancient Thummodera village near the Labugama and Kalatuwawa reservoirs, which supply water to the Colombo city, are also situated approximately 5km away. Another interesting place to visit just 1.6km away from the Bungalow is the Seethawaka Wet Zone Botanical Gardens. Situated on the Puwakpitiya - Thummodera road, the Park occupies a land area of 79 acres. It was founded in the year 2008 with a mission of conserving endemic and highly threatened wet lowland forest flora. It also features a famed rose garden. Guests can go on boat rides on an artificial lake within the Park. Paved in stone and guided by board maps and tree name tags, the garden is ideal for picture perfect moments. The large lawn area with kumbuk trees and a small lake is especially recommended to unwind in. Perhaps the Leisure World Water Park is the perfect holiday for families with kids, and adults with a sense of adventure. Just half an hour drive away from the Bungalow, the theme park is the first of its kind in Sri Lanka to offer visitors a range of experiences of water and amusement activities. Located on 52 acres of land, the Park offers lake rides, water rides, amusement rides and a separate kiddies play area to host parties in. Well trained instructors, operators, life guards and pool attendants are placed for optimal service.